Family celebrations, weddings, birthdays, corporate events, seminars... To enjoy your event, we advise you to book a Seine cruise on a private boat. We offer the best value price, and it can be adapted following the size of your group and the required services. Would you like to enbellish your event, or your visit, with a pleasant and unexpected moment in Paris? France Tourisme offers you to rent a human-sized boat to discover Paris from the Seine River. A simple cruise, or with a glass of Champagne, we offer you an unforgettable moment for a little price. 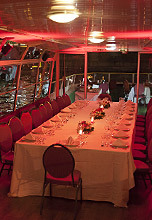 A dinner on a contemporary terrace boat in small group ! Want to share a magical time in Paris, good price for value ... ? 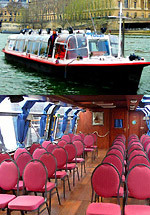 France Tourisme offers this exclusive dinner cruise up from 25 people. Ideal offer to close your seminars days and give a warm and elegant atmosphere at family gatherings. An excellent value, a meal for everyone, with attentive service. 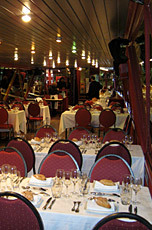 France Tourisme can organise your wedding evening in Paris, with a dinner cruise on a private boat. In an unic spot, you will discover Paris during a 2 hours Seine cruise and you will enjoy a musical atmosphere during your dinner and you will also enjoy the free sound system of the boat for your dancing party. Say YES to Paris!